East Horton Farmhouse has direct access from the road, with a spacious gravelled and secure parking area in front of the house. Access from this area is via the front door - 1060mm wide, and three very shallow steps - approx. 40mm. 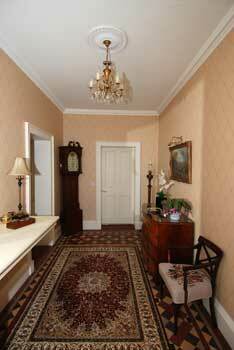 The hallway leading to the lounge and dining room. Inside, the house has large amounts of circulation space, good colour and tone with good natural and domestic light. 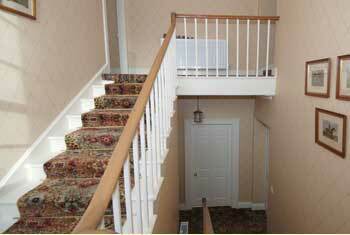 On the ground floor are the dining room and guest lounge both of which are comfortable and spacious. The three guest bedrooms are on the first floor, accessed by a wide and shallow staircase - ten steps to the first landing and the same to the upper landing. The steps are 14cm high and 30cm deep. There is a solid hand rail on the right hand side when ascending. All bedrooms are en-suite with a good size shower, toilet and washbasin. Shower handrails are available. Tweed (twin room) has two steps down into the en-suite shower room. East Horton House is not fully accessible to all disabled people due to the bedrooms being on the first floor, however all ambulant disabled people will be well catered for. This statement is a summary of provisions. If you have any specific questions please contact us and we will do all we can to help.